I was pleased then that, though belatedly, the process began with the publication a couple of years back of General Ranatunge’s memoirs. I have not read that, but reading this book has made me realize I should rectify that omission, to understand more about the problems this country has had to face. For his part, General de Silva has produced a graphic account of several stages in the evolution of the Sri Lankan army, with thoughtful but never oppressive analysis to suggest what should now follow. He begins with an account of his training, having been one of the exceptional cadets selected for Sandhurst when that was no longer the norm for Sri Lankan officers. After a brief account of his early formative years, with tribute to imaginative mentors such as Colonel John Halangoda, he moves swiftly into the first set piece narrative, about the JVP insurrection of 1971. His account indicates both the enormity of the threat to the country that that unexpected outbreak presented, as well as the ease with which the forces dealt with it, once they were able to take the measure of their enemy. I was also pleasantly surprised by fond accounts of two individuals I know well who played a significant part in events in the area in which General de Silva was stationed. One was W J Fernando, Government Agent in Moneragala, perhaps the area worst affected by the Insurgency. I used to stay with him often when he was GA in Kandy, but had gone abroad to university before I could visit him in Moneragala, to which he had been transferred on punishment as it were. He proved as capable there as he had been in Kandy, and General de Silva captures something of his wide-ranging capacity, including with words, for he was a notable punster. Delightful too was the description of his interaction with another old friend, Colonel Derrick Nugawela, who was coordinating officer at Hambantota. General de Silva describes his ‘Pukka Sahib’ English accent, and WJ’s reaction to this. Incidentally, Colonel Nugawela’s fascinating memoir, ‘Tea and Sympathy’, also published by International Book House, contains a vivid account of his military service, covering both the JVP insurgency as well as his work on TAFII, the Task Force against Illicit Immigration. General de Silva’s second set piece is his account of his own work on TAFII, which provides fascinating vignettes of life in a relatively relaxed atmosphere, with no great threat presented by the targets of operations. But soon enough we move into dangerous mode, with the beginnings of the Northern insurgency. Tellingly, the first sustained description is of efforts to prevent excessive retaliation by security forces – predominantly policemen, it seems, accompanied by three cooks from the army encampment. Unfortunately General de Silva does not expand on the damage caused to the Sri Lankan state by such retaliation when it did occur, and I believe he could have dealt at greater length with the development of militancy during the period in which General Weeratunge was in command in Jaffna with a mandate to stamp out terrorism. After a brief account of his first experience in charge of training, where it seems he contributed much in different periods, General de Silva has a vivid account of his meeting with General Zia ul Haq, President of Pakistan at the time, culminating in a fascinating description of his assassination some years later. After that interlude we move into the main business of the book, the various wars against the LTTE. A brief description of how it developed into such an effective force is followed by a description of the Vadamaarachchi Operation in 1987. General de Silva avoids the awkwardness of himself describing his own vital role in the proceedings by quoting from General Ranatunge’s book, and indicates how close the operation came to absolute success. But a few deficiencies delayed progress and soon enough the Indians intervened. General de Silva manages to convey both the resentment of the army at the advent of the IPKF, and also the manner in which the two forces learnt to cooperate against what both soon realized was a much more dangerous foe. 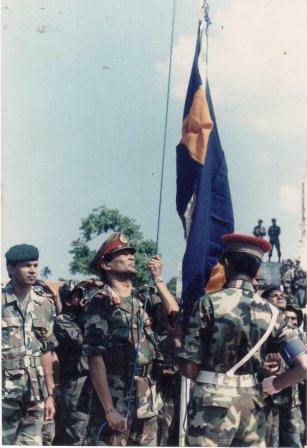 Unfortunately President Premadasa did not recognize this and, just about when the army and the IPKF, having ironed out several difficulties that General de Silva describes compellingly, were working together, he rescued the LTTE from what might have been annihilation. The manner in which the LTTE so swiftly took control of many areas in the North and East after this aberration is forcefully described, leading to the saddest part of the book, the account of the brutalities that accompanied the LTTE return to hostilities despite, or perhaps because of, the indulgence Premadasa had extended to them. General de Silva notes here the objections raised by the military in the form of General Ranatunge to the Premadasa approach, but sadly he does not consider the different advice that Premadasa might have received from other sources. In this regard I hope that at some stage there will be thorough analysis of the role played by Bradman Weerakoon in the two efforts of UNP governments to talk to the Tigers, with comparison of the excessive supplies to them of materials that were subsequently used with devastating effect against our forces. After graphic accounts of the betrayals and murders the LTTE engaged in, and their appalling treatment of Muslims, massacred in the East, ethnically cleansed from the North, General de Silva describes the way in which the forces gradually achieved equilibrium. The manner in which Elephant Pass was saved, after withdrawal from Jaffna and Mankulam, makes thrilling reading. But then followed the tragic death of General Kobbekaduwa, which had been foreshadowed at the beginning of the book in what is called an ‘Opening Gambit’, a description of what might be termed endemic conflict in the army. 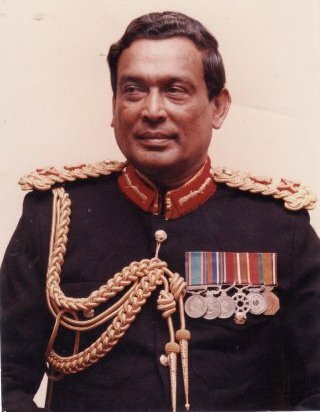 General de Silva relates there how the then Army Commander, General Waidyaratne, tried to reduce the responsibilities of Denzil Kobbekaduwa and Vijaya Wimalaratne. General de Silva persuaded the Commander to change his mind and the other two withdrew their resignations. Eight days later they were both dead, from a land mine explosion while on reconnaissance at Araly Point. 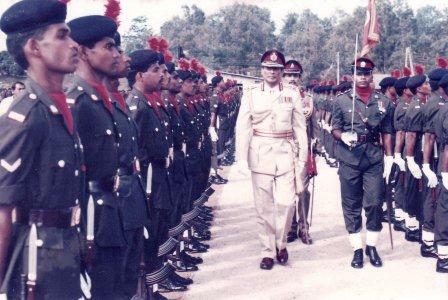 General de Silva does not analyse that tragic incident in detail as he had done with General Zia, and perhaps this was just as well, given the emotions the incident still rouses, but I believe he should have drawn attention to the indiscretion of so many senior commanders travelling together. I would also have welcomed some analysis of what has always struck me as two different tendencies in the forces, as represented most obviously by General Waidyaratne and General Kobbekaduwa. One was tough and took no account of the winning of hearts and minds, whereas General Kobbekaduwa, doughty fighter as he was, emphasized the need that General de Silva also recognizes to ensure that ‘the root causes of the conflict must be given due emphasis and a satisfactory political solution found that would address the aspirations of the minorities to be able to live in peace, harmony, with justice and dignity’. I have no doubt that General de Silva also belongs to what I would call the Kobbekaduwa school of thought. However he makes clear that this approach was not at all soft on terrorism, which was the erroneous view of those who subscribed to the iron fist approach without any velvet glove. I can only hope that the practical efficacy, let alone the moral imperative, of the Kobbekaduwa school continues to dominate thinking, which is essential for national unity and prosperity and ‘to neutralize attempts at a resurgence’. But that approach requires consistency as well as full awareness of the potential risks. 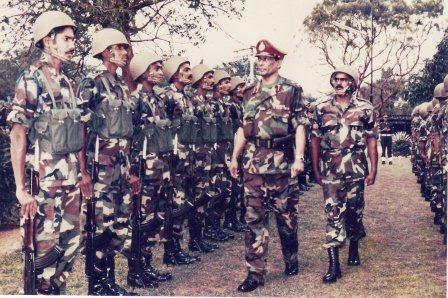 General de Silva is at his analytical best in his account of how the army gradually increased its capacities in the early nineties, how its plans were stymied by the political transitions from Premadasa to Wijetunge and then from Wijetunge to Kumaratunge, how it avoided when President Kumaratunge was talking to the Tigers (though only up to a point) the excessive indulgence of earlier peace talks, and how the sudden breach of their agreements of the Tigers was followed by significant successes, including the retaking of Jaffna. Interestingly, he notes that one reason for the Tigers resuming hostilities so soon was that ‘The popularity of CBK too amongst the Tamil polity was being enhanced daily and grew too much for the liking of the LTTE’. Unfortunately the retaking of Jaffna was followed by the classic Sri Lankan problem of complacence. There is just a hint that his own retirement as Army Commander contributed to the problem, with a change of strategy. This is mentioned almost in passing in the narrative, but taken further in the analysis at the end. There is no stress however on personalities, but rather, with laudable commitment to the lessons to be learnt, regret with regard to the ‘lull in battle and momentum of aggressive action’. So there followed several debacles, which contributed to the MoU with the LTTE in 2002. General de Silva does not go into detail about these, which I was sorry about, but this is understandable in a book that is largely autobiographical. I was glad however that, though not involved also in the subsequent operations, he has commented on the policies that ultimately vanquished the Tigers. He discusses both the ‘unwavering resolve’ of the ‘politico-military leadership, the role of a ‘committed Secretary of Defence’ who understood ‘the urgent need of military essentials’, and the refusal of the government to ‘succumb to repeated pressure’. He praises ‘three of the finest battle hardened Service Commanders’, notes the contribution of the Navy’s ‘impregnable blockade’, and mentions the many ‘brilliant field commanders’ who led the final attack along ‘five different axes of approach’ rather than the all eggs in one basket approach, moving from south to north through the Wanni, that had failed more than once previously. Earlier he had mentioned his own contribution to the training that enabled these forces to deal so effectively with not just a wide-ranging guerilla organization but also its transformation into what approached a regular force, using heavy weaponry and ruthless in its use of civilians as a shield. I can only wish that soon enough those who actually participated in the operations will write their own accounts, and in particular describe the operation General de Silva mentions briefly, to breach the defences at Puthumathalan and Ampalavanpokkanai and rescue the bulk of the hostages, one of the most remarkable truly national efforts ever made, with minimum civilian casualties as even TamilNet reports at the time indicate. The book is also most instructive in its suggestions as to how to best use a large army, and draws attention to an Indonesian model of tasking military personnel ‘to undertake development of their own localities’. The use of the military for added value education has already been tried, and should be taken further, with particular emphasis on not just cadet training but also teacher training with regard to core subjects. Measures with regard to welfare are also commended, and suggest the desirability of replicating practical programmes as have been implemented with regard to employment in garment manufacture. Most importantly I think he suggests that some of the former cadres could be integrated ‘within the military mainstream’ or ‘even form the core of the regional police force’. Given the extraordinary efforts of the present and previous Commissioner Generals of Rehabilitation in engaging the former cadres productively, I hope that this proposal will be taken forward soon. In summation, the book is an exciting and an instructive read. I can only hope that this exemplary Army Commander will also be an example for other officers to write their memoirs, without self-indulgence but so that their comrades, and their country, can learn to do better in the future.